A photo a day from Scotland’s biggest city. 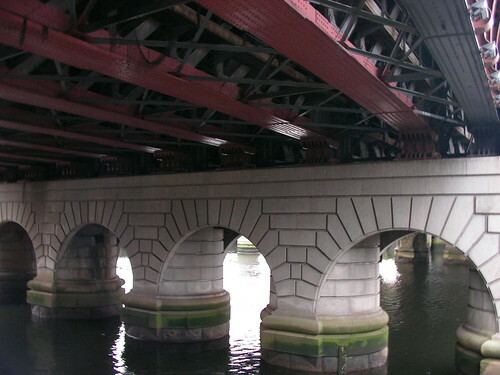 This was taken walking under yesterday’s railway bridge. I’d never noticed the pattern of the bricks round the arches before. 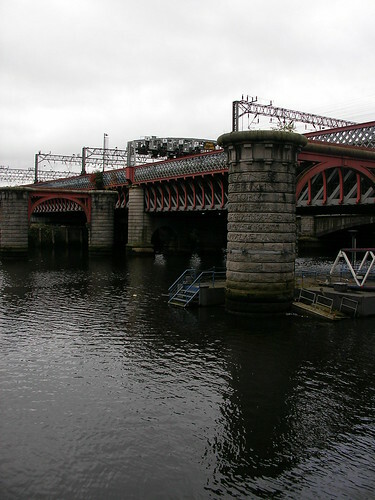 This is the bridge that carries trains to and from Central Station. Standing underneath it on the walkway with a train going overhead is quite the deafening experience. I only noticed very recently that the round structure (no idea what it’s called) has writing carved in it, but even when I enlarge the picture I can’t make out what it says. Some of the characters look Greek to me, but I could well be making that up! It’s colour, Jim, but not as we know it! Forgive the pun, I couldn’t resist! 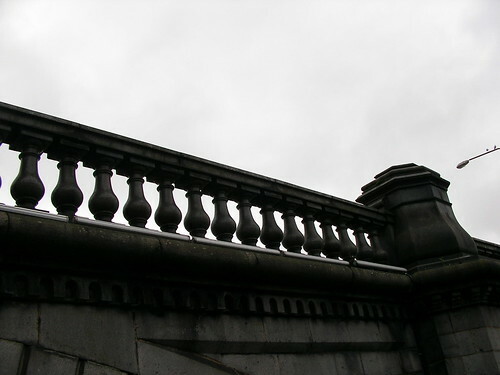 Again, this wasn’t a black and white shot, it’s just a particularly grey bit of Glasgow 🙂 I like the patterns and design on this bridge – nice and elegant and understated. This is one end of the bridge I’ve been showing the last few days. I took a fair few pictures as I walked along this bit of the Clyde, so I’ll show some more over the next few days. I struggled a bit with the exposure on this, but still quite like the results. 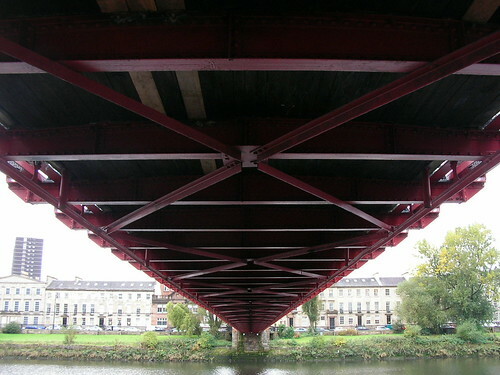 This is the underside of yesterday’s footbridge. Here’s some more of those lovely Glasgow grey skies! 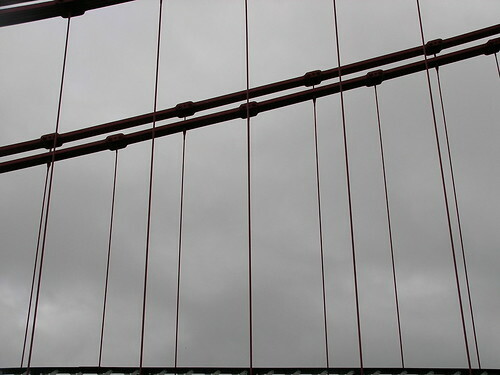 This isn’t a monochrome picture (if you look very closely you’ll see the actual colour of the bridge), but it felt like a monochrome day. I thought I’d experiment a bit, I quite like this one. This is from one of the footbridges over the Clyde – at night it’s lit up red (I’ve shown it on here before) and looks totally different. I know I’ve shown a lot of photos of blue skies on this blog (generally because I’m more likely to take lots of pictures when the weather is good, and then I can show them when it’s too wet and miserable to take pictures). But it’s been distinctly grey lately. 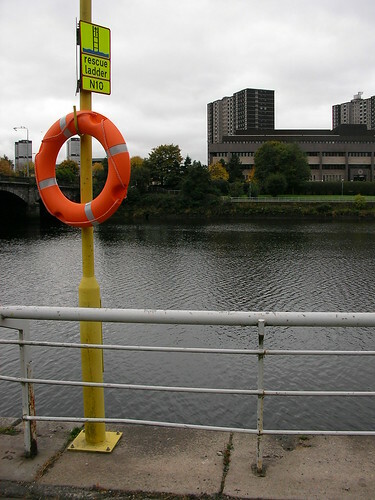 This was taken along the Clyde walkway – I liked the contrast between the bright orange and yellow of the rescue gear, the grey of the river, buildings and sky and the odd splodge of green and yellow from the trees. 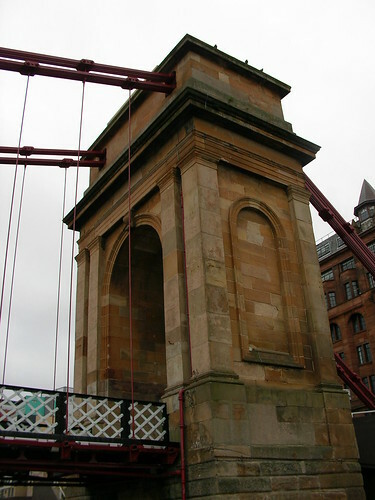 The building over the river, in front of the tower blocks, is Glasgow Sheriff Court. Here’s some of the varied architecture you can find at the University of Glasgow along University Avenue. 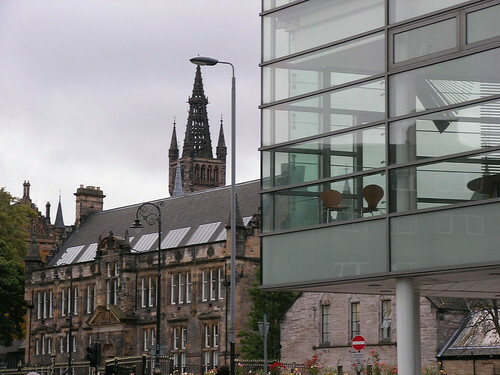 The glass building is the Wolfson Building, home of the medical school. You’re by now very familiar with the tower from the Main Building in the background. The building between the two I think houses the Botany Department (but I’m open to correction on that!). Last Saturday in Sauchiehall Street there was a stall being manned by the RSPB (Royal Society for the Protection of Birds). 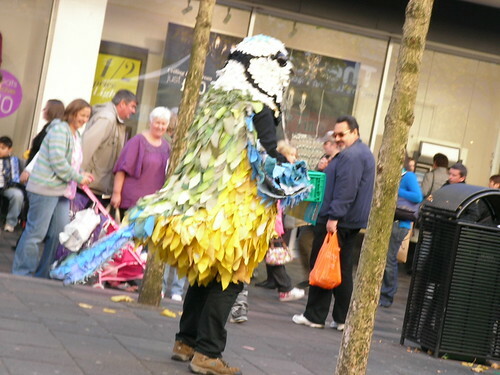 This guy was handing out free bird seed to passers by, while the more sensibly dressed reps were hiding in the stall handing out leaflets and no doubt pretending they weren’t with the mad feathered guy. I was pleased with this one. 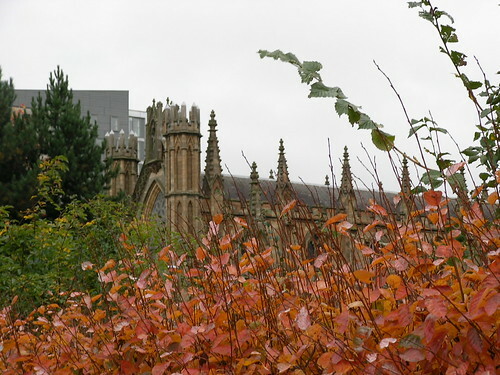 The cathedral peering out from behind the autumn leaves is St Andrew’s, the Roman Catholic Cathedral which is on the banks of the River Clyde.